Copyright Jayne Birchall How perfect a day. As you pull up in the car at the lych gate your bridesmaids welcome you, straighten out the creases in your dress, and rearrange your veil. There’s only one thing to top it all, the bells ringing announcing this happiest of days. Are there bells in your church? This map will help you find out. If you are from outside Derbyshire, then this web site locates churches by your postcode. How to request bells for your wedding? If you need further advice, please email . 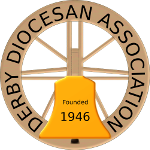 The Derbyshire Diocesan Association of Bellringers (DDA) represents the local dedicated band of men and women who are at the end of the ropes. Ordinary men and women who love to keep alive the extra-ordinary tradition of Bellringing. We have ringing members at churches throughout Derbyshire from your local village parish church to the Cathedral. Just drop us a line and we can sort the rest. Even if your church doesn’t have its own ringers don’t worry, we’ll find them for you.